The sum of the total dollar value of all shares traded on stock exchanges is defined as “market capitalization”. It represents a share of the wealth that has been entrusted to the stock market and represents the accumulation of decades of investment decisions. One of the measures for making an assessment of the effectiveness of the stock market is to compare it with GDP, which is a measure by which a society evaluates is productive capacity. The gross domestic product (GDP) is one of the primary indicators used to gauge the health of a country's economy. It represents the total dollar value of all goods and services produced over a specific time period. It is the size of the economy. The relationship between the valuations of the entire stock market compared worth the GDP is one of the primary indicators of the worth of investments that are traded on the stock exchanges. The best independent assessment of what can be expected from the stock market is the Shiller Price/Earnings market return. The Shiller P/E is independent of market sentiment and reflects the economics of prior earnings. The Shiller P/E has varied from 0% returns in 1996 to the current levels of below zero. Though there has been a short-term upward spike in returns that has been countered by an extended period of unfavorable returns. At present the calculated price/earnings investment returns continue near zero, which does not suggest an attractive stock market environment for retirement investors in the near future. When the Federal Reserve floods the economy with cash, as happened after 2008, the holders of capital assets will shift from making long term investments in job-producing long-term capital to short-term commitments of financial assets. It is the government financial policy of creating an apparent prosperity in the stock market that will displace less liquid investments that ultimately contribute to gains of the GDP. As capital moves into financial speculation, less money will be available for supporting productive investments. 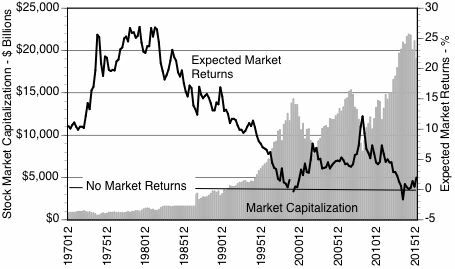 CONCLUSION: The decline in market returns since 1980 are an indication that although investment profits were made from an appreciation of rising prices the investment returns based on earnings have declined steadily. Ultimately the worth of the stock market depends on earnings and not the fluctuation in stock prices, which are a reflection of investor sentiment. At present the seniors should not be expecting gains from their retirement investment funds because the market is overpriced and therefore investment returns will remain extremely low and even negative in recent cases.